Ever since I made that zebra cake months ago, I have been completely fascinated by the possibilities that this method allows. Zebra cheesecake, zebra cupcakes, zebra layer cake…I totally want to try all of those. Enter pinterest and the ideas seriously don’t end! Then I saw this Zebra Bunt Cake on Bakers Royale, and I was totally infatuated. 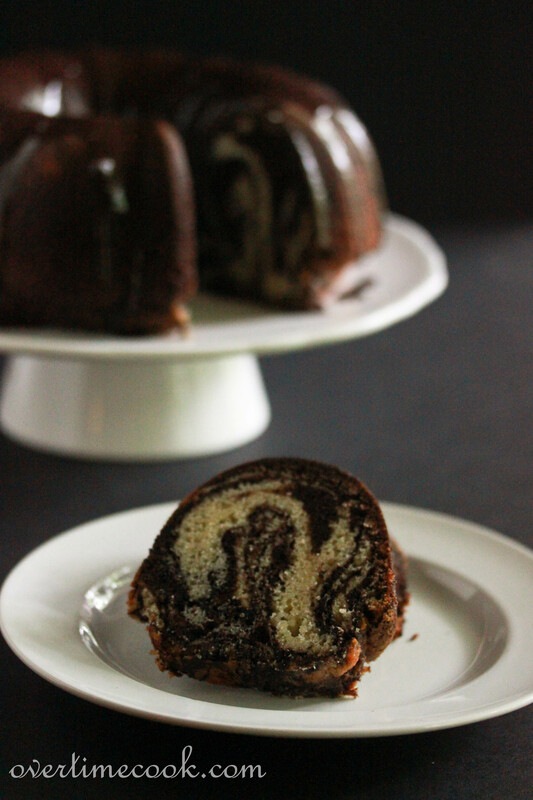 Combine zebra style with my favorite kind of cake (bundt cake, duh) and you have a gorgeous and winning dessert. Best thing about this cake? It looks gorgeous, but it totally tastes amazing too! The zebra style does take an extra couple of minutes, but I think it’s well worth it. If you’re confused about how to get the pattern, scroll down for my step by step pictures, taken from my iphone as I formed the cake. Does anyone know the best way to get cake batter off of an iphone? Asking for a friend. Preheat the oven to 350. Grease a bundt pan well with baking spray (oil and flour). Set aside. In another small bowl, mix together 1/2 cup sugar, the cocoa powder and the water. Stir until a smooth paste forms. Set aside. In the bowl of your mixer, cream together the cooled melted butter and the remaining 2 cups sugar. Add vanilla and beat until combined. Spoon a heaping tablespoon of the white batter into the bundt pan. Spoon an equal amount of the chocolate mixture directly in the middle of the white. Next, spoon some white into the center of the chocolate. Repeat until all of the batter has been used. Bake at 350 for 50-60 minutes, until a toothpick inserted in the center comes out clean. Mix all ingredients for the glaze together to form a drizzling consistency. 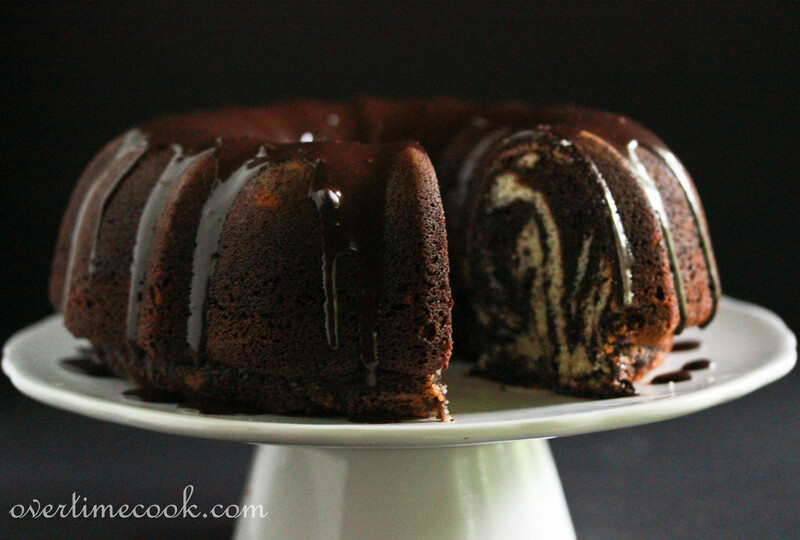 Really like it – have been putting off buying a bundt cake, but would say I’ll have to go for it! Bundt cakes are the BEST! This looks great! Thanks for the step by step instructions for making the zebra pattern! Thanks Elizabeth! It’s really not hard once you get started! Wow, this is a really impressive looking cake! So beautiful! Gorgeous bundt inside and out! Thank you Paula! I am into aesthetics, so that really counts in my book! That is a really gorgeous cake. Thanks for sharing. When I get cake batter on my phone, I usually let the dog lick it off. Hopefully, you only got the vanilla flavor on the phone, so as not to poison your pooch with the chocolate. Oh, you really need one! They are a great household tool. They will clean up everything you spill! But of course, you will then need to get a goat, to eat all of the shreds of furniture and clothing left behind by the dog. So, maybe that’s not such good advice after all. Keep cooking. Love the recipes and the pictures! Beautiful! I have always wanted to try this and you make it look so easy! Thanks Mercedes, you should definitely try it! This looks gorgeous! And great job on the photos!!! Thank you so much! What a great compliment coming from you!! Reblogged this on Ummush’s Blog. MIriam…I don’t have any soy milk or subsitiutes in the house and don’t really wanna go out to buy…can i make the cake leaving that ing out? I’m sorry, but that won’t work. You can try subbing some other liquid but I don’t recommend it. I think I will have to try making this! Yummy! Looks amazing too. i just made this last night and it is dry dry dry! i don’t like the rich’s whip as it’s artificial, so i used almond milk. thoughts? It’s hard to say where you went wrong without being there, but in general, changing the ingredients can be problematic. Also, it’s possible you baked it too long. Can I substitute oil for The margarine ? I’ve never tried it but I’ve heard from people who did and they say it worked fine. How much oil for the margarine? I haven’t tried it, but I’ve heard people sub the full amount and it worked nicely. Just took one out of the oven. Smells amazing. Can’t wait to see the inside. what is cocoa powder? is regular hersheys cocoa good? Yes, it’s regular cooca powder. This is the best cake ever! every time i make it for shabbos !its gone by monday already!!!! just checked it at 55 minutes and was still wet… hope it;ll get ready soon! Just made this, looks amazing! One suggestion, in your instructions you say to put the flour mixture and the cocoa mixture in 2 small bowls. I would change that to medium bowls! Thanks for all your great recipes! Shabbat shalom! 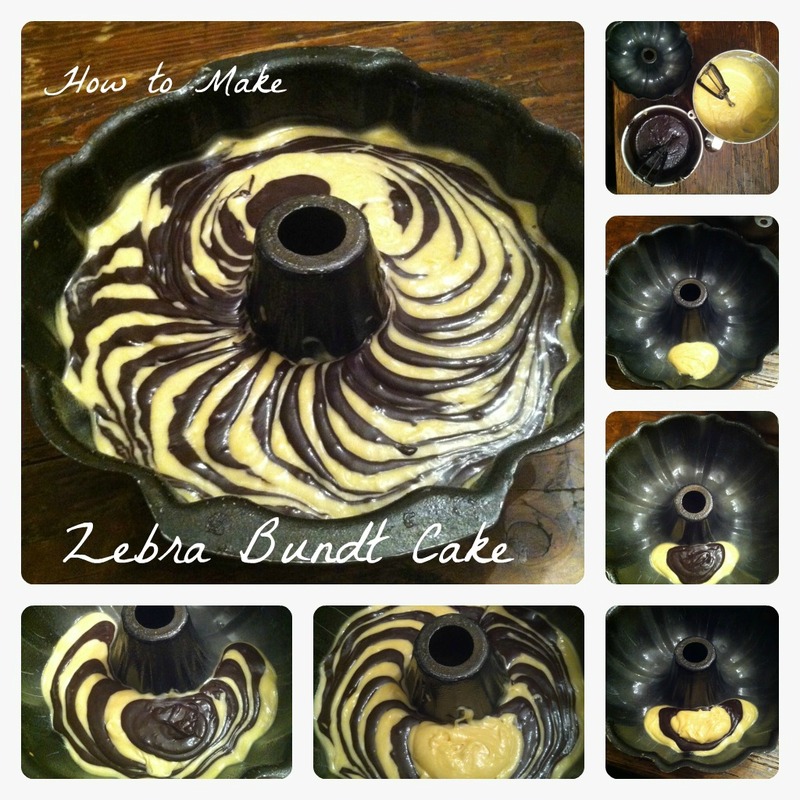 I only discovered the zebra cake abd then zebra bundt cake not to long ago and I’ve been passing it along to everyone. I have to say this is by far the greatest hit as far as bundt cakes go…not one person disliked. After all what’s there to dislike???!!! Miriam, you need an app! 🙂 love ur blog….. Sounds awesome! I know margarine is so much yummier, but can I use oil instead? Does it freeze well with the glaze on it? Better without, but if it’s on already – go for it! Will be fine. Hi. I can’t wait to make this, I just have a few questions. 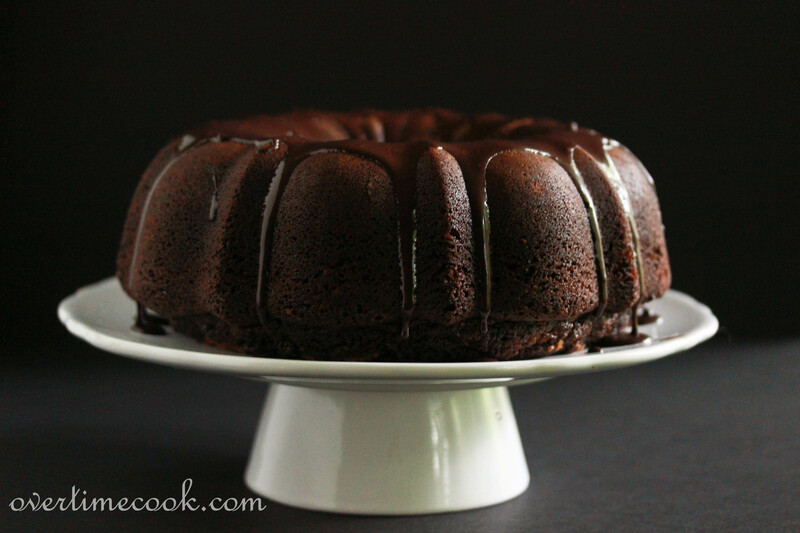 Do I take the cake out of the bundt pan when it’s hot, or only after it has cooled? Also, is non dairy creamer the same as rich’s whip? Alternatively, do you know of a pareve soy milk I can find? When you say you replace the milk with Rich’s whip, is that the non dairy creamer or the whipped topping? Hi! Looks yummy! You used rich’s whip which is like heavy cream as opposed to parve soy/almond milk? Can I substitute oil for margarine? The cake came out delicious. It was a hit with my family this week for Shabbos. Thank you because I have head some epic failures lately and this one was a huge hit. I the zebra pattern and the texture of the cake was fantastic. Can I use oil instead of the margarine? Does this freeze well?? and if yes, how do I freeze it?? I know I’m really, really late to the party here, but I made this cake for my birthday this year and my colleagues ABSOLUTELY LOVED IT! I have never received so many compliments for a cake I’ve made (and I’m known as *the* baker among my friends and family). Thank you…. your recipe is a hit in Austria!